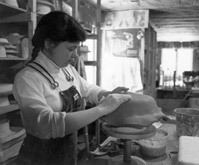 Mountaine Meadows Pottery began in 1974, the year Mark and Deborah were married. It started in a mountain meadow in Colorado, 9,000 feet above sea level. Deborah wanted a name that felt like the New England home she missed so much, so she added an "e" to the end of Mountain and an "ie" to the end of pottery and Mountaine Meadows Potterie was born. 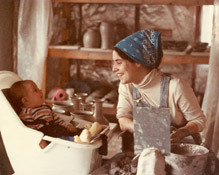 Soon, Deborah was making more pottery than she could give away, so Mark helped pack their 1968 Saab and off they went to craft shows. They were happiest when they were working together, and they began their careers together as a team, making things by hand for people to use in their daily lives, raising their children together, and eventually creating jobs for others. In 1978 they moved back east to northern Vermont, where they bought some land with a little farmhouse and a barn right next to a brook and an apple orchard. It had no running water or bathroom and was heated with a wood stove. In the winter, if they weren't careful, the pottery froze during the night! It was a marvelous place to start a family though. Nathaniel was born in 1980 and had a spot in the studio that everyone called his nest. It became obvious that they couldn't raise a family and still count on Deborah to make all the pottery. They took the big plunge and hired a helper. They squeezed 10 employees into that little barn before, once again, it was time to move. This time they wanted all the luxuries - flush toilets, hot running water and a furnace for heat. And they wanted room to grow. An abandoned stonecutting factory fit the bill. It was big and well lit by large twelve pane windows. The move was made in 1983. 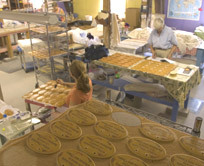 All the employees came along, bringing wheels, clay and rolling pins. Everyone marveled at the little kitchen, the bathrooms and the smooth floors for rolling carts on. The new building called for a public sign and it became clear that people driving by didn�t understand the word Potterie. With the new building came a new name: Mountaine Meadows Pottery. 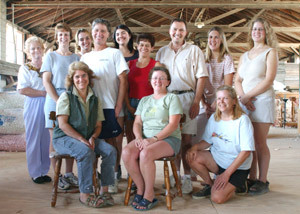 The Mountaine Meadows family grew steadily, as did Mark and Deborah's own family. Ariel was born in 1986. 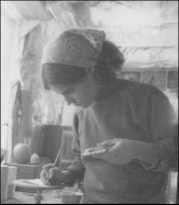 By the time she was 5 she was making pots on the wheel, at 6 she was selling them at shows. 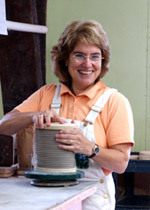 Now she is teaching pottery. 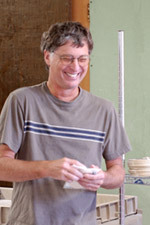 Nathaniel, now 25, designed and produced this website, his second for Mountaine Meadows Pottery. It has been an exciting and eventful 28 years. We never imagined we would fill our old granite cutting factory, but here we are, occupying even the top floor under the rafters. "There is nothing like running your own family business. You raise your children in your work place and are in total partnership with your spouse. Your children learn from your business and you get to be surrounded by interesting and talented people all day. If anyone asks us about going into business for themselves we always say DO IT!"